Great Britain could face a Belarus team headed by Victoria Azarenka as they bid to reach the Fed Cup world stage. 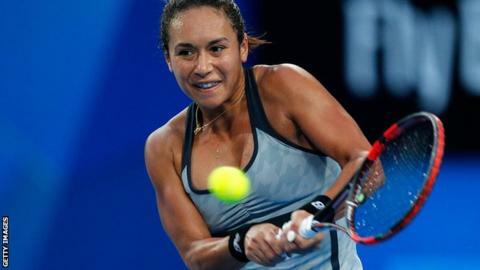 The team - featuring Heather Watson and captained by Judy Murray - will play Ukraine, Turkey and Liechtenstein in February's qualifiers in Budapest. If they finish top of their Euro/Africa group, GB may need to beat Belarus in a play-off to qualify for World Group II. Johanna Konta, Anna Smith and Jocelyn Rae will make up the British team, with Laura Robson absent through injury. Watson is currently ranked 50th in the world, while Konta, who briefly broke into the top 100 last year, sits 146th. Ukraine are likely to provide the toughest match in qualifying with world number 28 Elina Svitolina and 88th-ranked Lesia Tsurenko in their team. Fifteen nations will compete for two places in the World Group II play-offs. Should Britain win Euro/Africa Group B, they would go forward to a play-off against the winners of Group C, likely to be Belarus. The winners of the play-off then progress to the World Group II play-offs in April. Britain reached that stage in both 2012 and 2013, but lost to Sweden and Argentina respectively.